All of our warm, cozy and comfortable rooms are all individually decorated and have seen many repeat visitors over the years. Our rooms are updated frequently. All of the rooms are inspected yearly by 3 different highly regarded travel &health industry professional organizations. All have private baths, unlimited high speed internet and A/C. Most have large HIGH-DEF televisions with movies on demand. Visitors over the years have included Speaker of the House Newt Gingrich, actor singer Jimmy Dean, writer Tom Wolfe, columnist Miss Manners- (Judith Martin )and Columbian Ambassador to the U.S. Luis Villegas. Fishing guests have included U.S. Senator John Warner and Boston Celtic great and Hall of Famer John Havlicek. I would recommend this Lodge for a great night's stay. We were provided with a wonderful room. This comfortable Room has a Shaker Pencil Post Queen Bed with our signature Kingsdown bedding, is guaranteed to give you a pleasant night’s sleep. This bedding is used is the same as used in several 5 star high end lodging facilities. It is a big reason we have so many repeat visitors. An activity guide in the room will give you plenty of ideas on getting the most out of your stay with us. Foam, feather and simulated feathered pillows are most comfortable. All ofthe Lodge rooms have Oriental rugs with nice window treatments including room darkening shades in most. 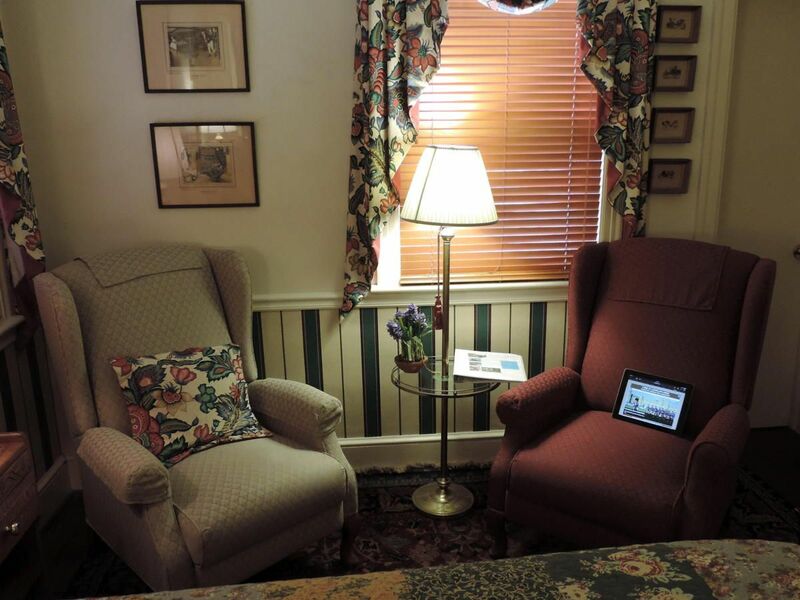 A reading chair and 2 reading lamps bedside the comfy bed make for great reading or internet exploring. The new private large Bath has Tub/shower, hair dryer, fluffy Egyptian towels. Free Wi-Fi- coffee & tea maker. This smaller , cozy room has lots of wicker & ivy and is always a favorite for those traveling lightly and on budget. The Queen bed has ivy backing and the Kingstown extra plush mattress will insure you get a comfortable nights’ rest after a day of exploring. This is the very same bedding used in many high end 5 star places and is one of the main reasons so many people come back enjoy the great comfort that they provide. Flooring is an attractive Oriental rug. Private bath with stall shower, fluffy Egyptian towels, hair dryer. Small reading chair, ample lighting bedside for nighttime reading, Free Wi-Fi. Guest computer, printer, T.V., guest frdge,Fax available downstairs. A very cozy room, the Cherry Panel Queen bed with comfy Kingsdown mattress is a pure delight to spend a night or a week on. This is the same bedding used in many high end 5 star lodging properies and is a major reason we have so many repeat visitors. 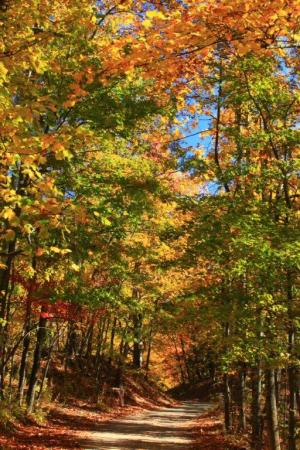 An Activity guide composed by host John, 65 native of the area, has lots of ideas such Scenic Driving routes using Llewellyn Lodge as your base. John spends all of his break time in the outdoors when not doing B&B work and of course these areas are covered in detail. Two chairs with ample lighting in this room make for perfect spots to read or plan your daily adventures while staying at the Lodge. Big screen high definition cable TV -on demand movies, events. Wi-Fi, Private bath has large stall shower, fluffy Egyptian towels, hair dryer-coffee and tea maker. A guest favorite for over 32 years with Cherry King bed and Kingstown mattress is extremely comfortable. This is the same bedding used in many high end 5 star lodging facilities. It is one of the biggest reasons we have have so many repeat visitors, comfort is one thing travelers don't forget as we have found out in 32 years of innkeeping. We have 2 very historic older homes next door, General Robert E. Lee used to visit one of them and the other was the home General Francis Smith, Viirginia Military Institute's first superintindent. Guests love the walk downtown by several more of these historic and architechually interesting homes. Choose one of 2 reading chairs to enjoy a bestseller or treat you to a large High Definition cable television- on demand movies, events. Well stocked fridge and large private bath with tub/shower, fluffy Egyptian towels, hair dryer. Great space for long term stay. Free Wi-Fi. Keurig Coffee, tea maker. 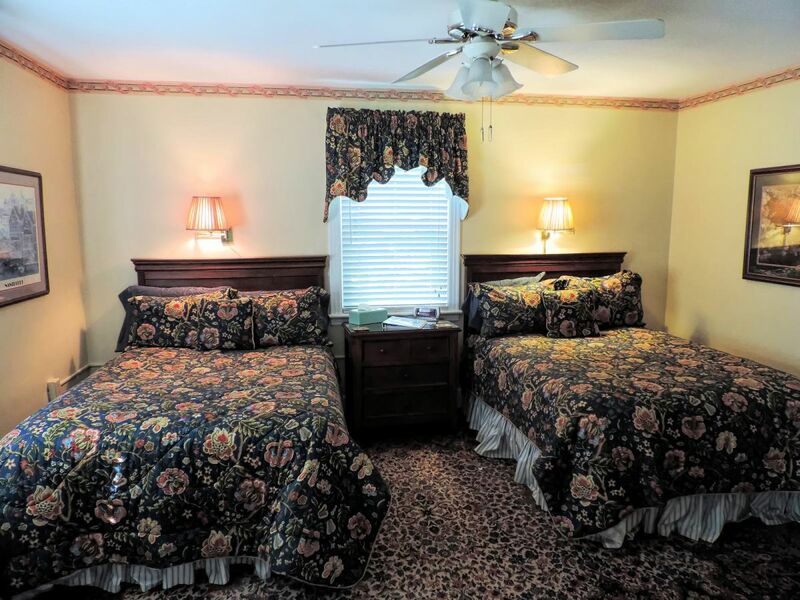 Families and singles wanting to share a room find this the perfect room for their stay in Lexington, and favorite of those visiting Washington and Lee University or VMI. The bedding is Kingsdown, the same as used in many 5 star lodging facilities. Comfortable bedding is something that guests don't soon forget as we have found in our 32 years of innkeeping. An Activity guide composed by John your host and Lexington native of over 50 years, has lots of tips for Scenic driving, downtown exploring, shopping , outdoor activities and much more. Don't forget we have the only Blue Ribbon breakfast from a menu in the area included in the rate. The two comfort laden Double Kingstown beds bring many repeat visitors. Large screen High Definition Cable TV -on demand movies, events with a reading chair-Free Wi-Fi. The large private bath has a stall shower, fluffy Egyptian towels, and hair dryer. $25 extra charge per person. Sleeps 4. 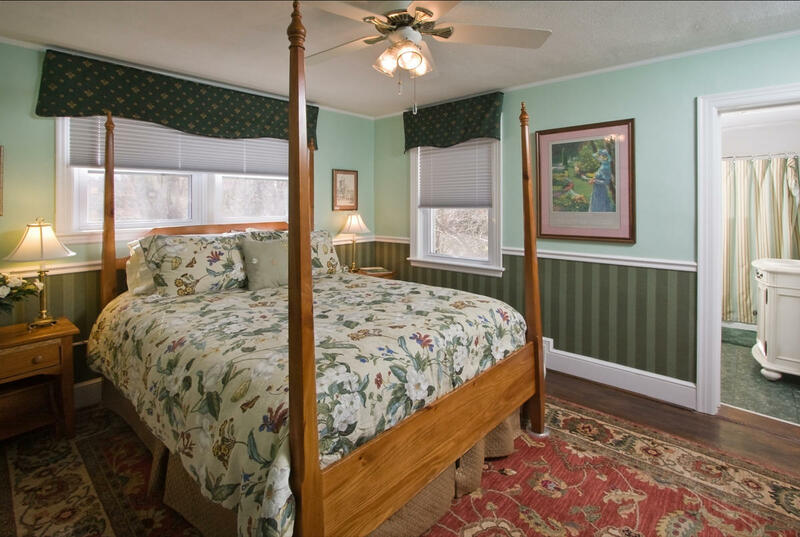 First floor room with King Bed and our most comfortable Kingsdown bedding. Especially good for those not wanting to climb stairs. This room has incredibly comfortable Kingsdown bedding, the same used in many 5 star lodging facilities. Repeat visitors are a huge part of our business and comfort is something guests just don't forget. Don't forget our Blue Ribbon Breakfast from a menu is included in the rate. Large screen High Definition Cable TV- on demand movies, events, Free Wi-Fi and reading chair. The large private bath has a granite Tub-shower, fluffy Egyptian towels and hair dryer.-Coffee, tea maker. Llewellyn Lodge has a separate Large Suite with very comfortable Double bed, Kingsdown mattress. 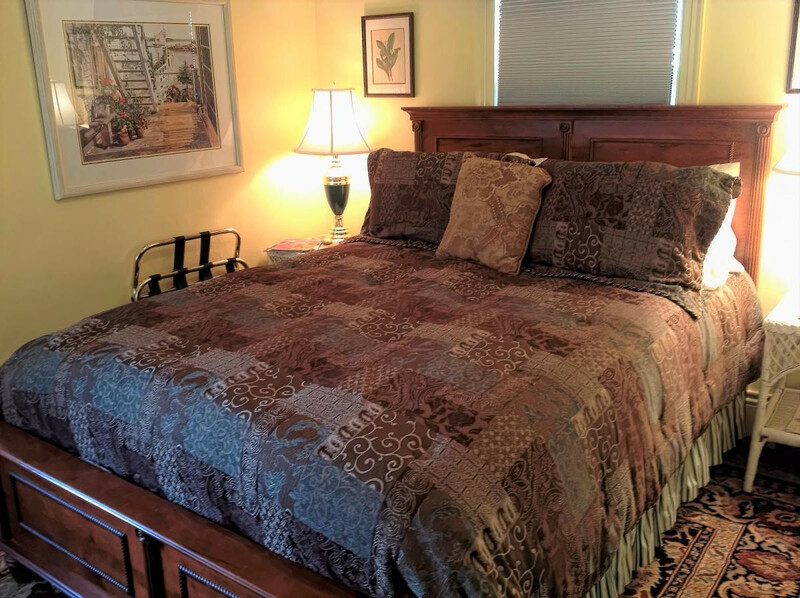 This separate unit makes the perfect place to stay for those visiting Lexington on business a wanting short or long term rental. Wi-Fi, kitchen, large living room, tub-shower desk, cable TV, several reading chairs. Coffee maker, fridge, microwave, electric range, Egyptian towels, hair dryer and more. Contact the inn at: (540) 463-3235. The living room at Llewellyn Lodge is always the perfect spot to meet after checking in or returning from a day of exploring. 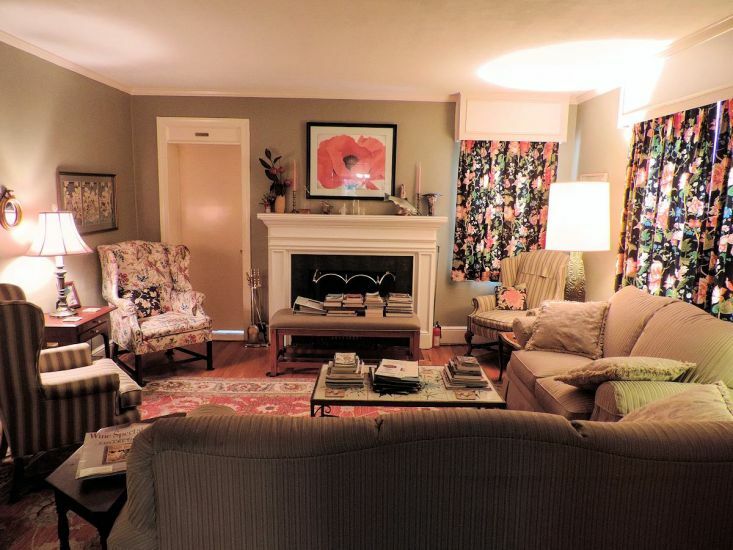 Several reading chairs and 2 sofas provide excellent space for gathering or just plain taking it easy. One of the most enjoyable elements in visiting Llewellyn Lodge is meeting and talking to fellow guests from all over the world. John and Ellen are always happy to help guests plot out their activities or make dinner or theatre reservations. Updated restaurant menus are provided, the walk is only 8-10 minutes through a scenic historic neighborhood. We were hot tea, lemonade, sodas, cookies and more in the warmer months. John’s ‘’Killer’’ Hot Chocolate, hot spiced cider and tea are wintertime favorites in front of a cozy fire. A separate room for guests includes a well stocked fridge with snacks, a TV and guest computer with high speed internet is also in the room. Fax and copy services are available. A copier is available for business or travel use, boarding passes, etc. Wine glasses and openers are always available. Fresh Virginia peanuts are offered along with other treats. 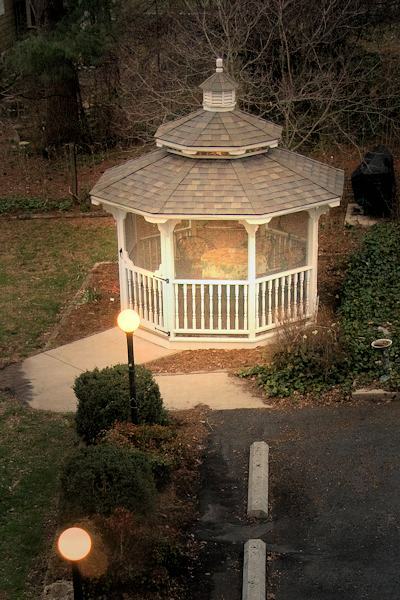 Our Screened Gazebo with ceiling fan and lighting is very popular with our guests. It’s a great place to unwind, read or to enjoy a nice drink or picnic. Wireless Internet is available there as well. The front porch swing is an old favorite and we have a more private side deck. A separate guest computer with high speed access is also available free of charge. A copier is available for guest usage, many guests love to copy boarding passes to save time. Special notebooks detail area activities, outstanding scenic drives and much more are always at your bedside. Golf and tennis privileges are available at the local Lexington Golf and Country Club, 3 minutes away.